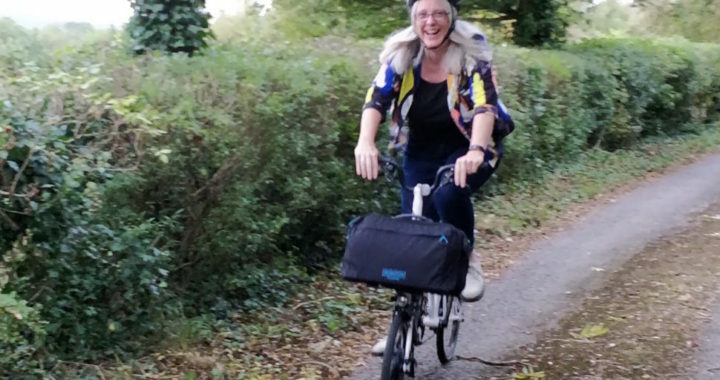 I have owned a Brompton for the last 8 years, and it’s been my main form of transport to and from railway stations on my commute. However, the issue with Bath is the hills, and a seemingly endless uphill climb home at the end of the day. I often used to ask my husband to pick me up in the car instead of riding home. So, when I saw that Brompton were making an electric bike, I put my name down. I’ve had this bike for a couple of months, and it has been quite the topic of conversation on the train in the mornings. I’m happy to say that I can now make it up the hill! 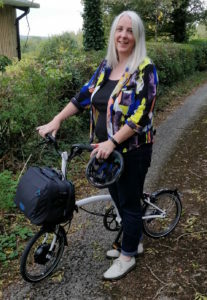 It’s not that the bike does all the work for you – you still have to pedal quite hard, so you do get a fitness benefit – but it does feel like the hill is only half as steep. That’s enough to make it achievable for a cyclist like me. As with all things Brompton, it’s very well designed. It still folds the same way and fits in the train luggage rack. It is a bit heavier, but the payback is it’s speedy, less tiring and so you make fewer car journeys. The main thing is to not think about an ebike as just a bicycle, but rather as an additional vehicle, or a replacement vehicle. Just remember to make sure you’re very visible at all times. I recommend a bright yellow poncho over your normal workwear for rainy days!